Islamic Foundation accepts your Zakat and distributes to the needy according to Islamic Regulations. You can pay your Zakat online by clicking on “Pay your Zakat” icon or drop your Zakat contributions in the drop box at the Islamic Foundation lobby. If you would like to receive Zakat, please reach out to the Islamic Foundation Zakat Committee. You can also send fully filled up Zakat Request form to the email shown below. 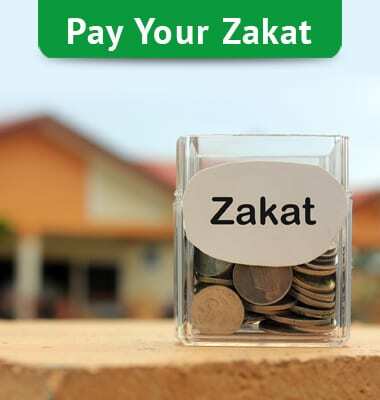 Zakat is one of the five pillars of Islam. It is obligatory on all Muslims (men and women) who possess wealth at least equal to ‘Nisab. Nisab is the minimum amount of one’s holdings on whichah must be paid. The Nisab is 2.85 ounces of gold (the approximate value of 2.85 oz. of gold is $4,500). Any believer who refuses to pay Zakat is not a Muslim. It is the most important act of lbadah after Salah. It purifies assets and creates virtue. The Holy Our’an and the Prophet’s (PBUH) Ahadith warn of severe punishment to those who do not pay their Zakat. Every Muslim is required to pay Zakat-ul-Fitr during the month of Ramadan as a token of thankfulness to Allah for having enabled him to observe fasts. Its purpose is to purify those who fast from any indecent act or speech and to help the poor and needy. Zakat-ul-Fitr is incumbent on every free Muslim who possesses one Sa` of dates or barley which is not needed as basic food for himself or his family for the duration of one day and night. Every free Muslim must pay Zakat-ul-Fitr for himself, his wife, and children. It should be paid before Salaat-ul-Eid. For 2018 the Zakat-ul-Fitr rate is $ 10 per person. 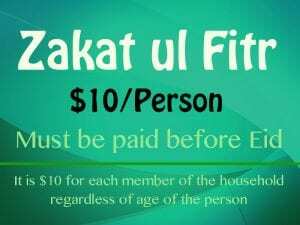 It is strongly encouraged to pay Zakat-ul-Fitr(Fitra) days in advance so that it could reach the poor and needy. You can drop your Zakat-ul-Fitr in the Donation Box at Islamic Foundation Lobby or donate online by clicking on the Zakat-ul-Fitr Icon.